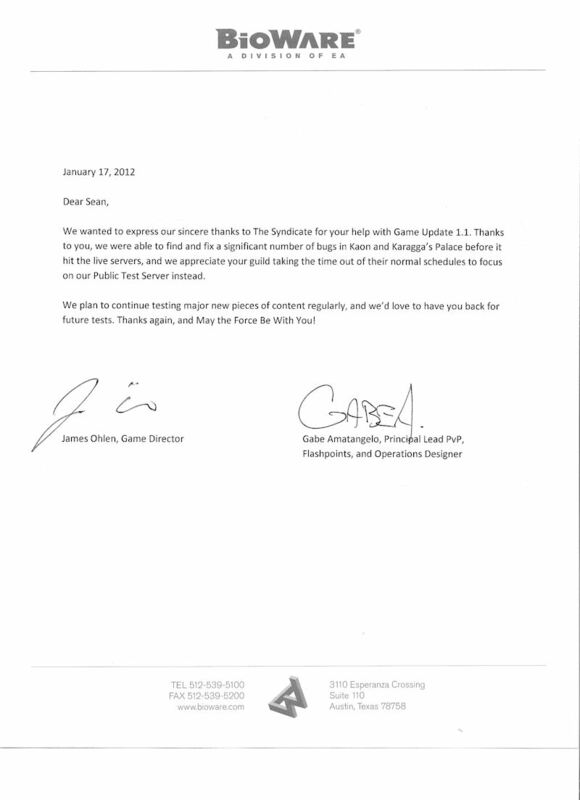 By the time Star Wars: The Old Republic launched, The Syndicate already had many months in the game. A team of over 50 people had more than 10 months invested and a team of over 200 additional people had 6 months invested. There was a massive collection of game knowledge within the guild that had already led to reports being issued on critical changes needed to the guild system and to the community/communications tools. As the 1.1 patch geared up for launch, Bioware assembled some Strike Teams to assist in testing the patch and recommending changes where needed. The patch contained a new Flashpoint; an expanded Raid (called an Operation in SWTOR speak) and tweaks to PvP. The Syndicate was requested to form a Strike Team which we did so gladly. While the game had only been live for a couple of weeks, we already had dozens of level 50s who were very active in PvP, operations and flashpoints. A team was assembled and they spent many hours hammering on the patch. Feedback was given; tweaks were made; and when the patch launched the Flashpoint and the Operation were very well received. The PvP tweaks, however, were a lesson learned for all involved. Testing went great! With roughly balanced numbers of Rebellion vs Imperials the tweaks are a great deal of fun. However the reality within the game itself was that Imperials outnumbered the Rebellion players (often very substantially) and under those conditions the tweaks needed to be altered else the Rebellion stood no chance. When all was said and done, we received a nice letter in the mail thanking us for the help. We went on to continue to staff Strike Teams and assist in future content reviews and balancing.